I just trusted the pattern. I did just what it said. Who's the expert on cuff-down socks? Not I! Still, I'm fairly sure this is not how cuff-down socks are normally constructed. Next round.--Rib 60 sts., turn, rib 41 sts., turn. Now work 1 in. in rib on these 41 sts. for the instep, ending witth a row on wrong side of work. What is going on?, I think to myself. What could the possible purpose of this be? After a long while of pondering, I finally understood. You see, the heel flap is knit with the yarn double-stranded. And the instep isn't. So, to get around this, they have you knit them separately. Why they don't just have a shorter heel flap, though, is beyond me. It's a screwy pattern. For the second sock, I'll just knit that extra inch of heel flap and instep together with one strand of yarn, and start the doubled yarn once I knit the heel back and forth. Upon finishing my second sock, into the box it goes along with various other goodies for my boy in the UK. 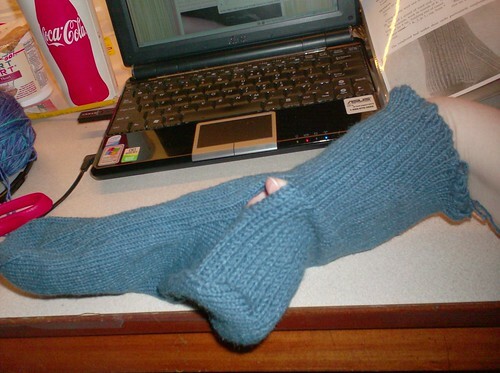 I am willing to put up with the torment that is the screwy cuff-down vintage sock pattern, for him.